I'm been following this project for a while. I'm really impressed, and am glad that you're revisiting this project! I found a few bugs in the network, and I just wanted to share them with you. The Up stopping platform at Newark Northgate is missing a bit of electrification at the junction, which causes trains booked to stop there to run through the station then reverse. Convoy (1629) on the London LST - Norwich (Fast) line has one extra coach, which makes it keep generating a message saying that it "is too long for the next stop". There is a Pendolino stopped at one of the underground platforms at London Euston with no schedule. - The missing electrification on that tile in Newark is intentional because I want to avoid non-stop trains trying to go through that platform while another train is waiting there. However, I've moved the Edinburgh stopper to the other platform so it doesn't reverse. - That convoy is indeed one coach too long. 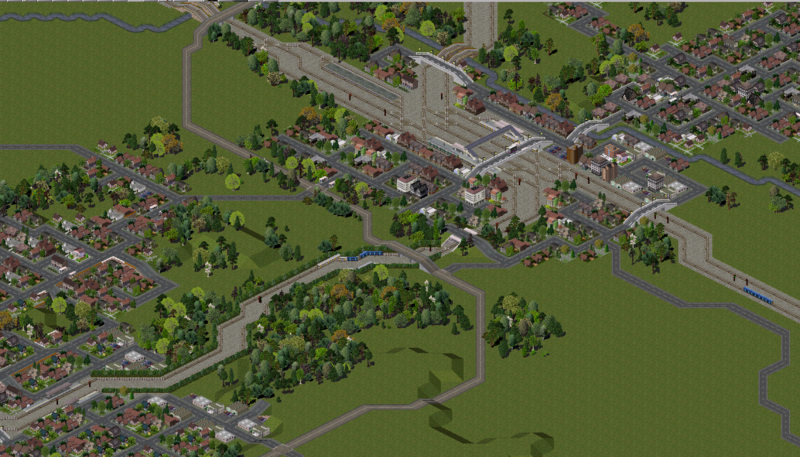 However on my map it's still only 7 station tiles long (convoy window > details) so I'm not getting any of those errors. Strange that you are. 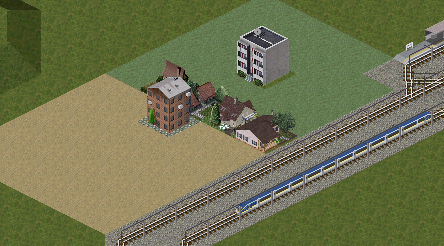 At one time I had the wrong graphics on those trains - maybe that problem persists in the version you have? - Well spotted on the Pendolino. Coincidentally I found and deleted it earlier this week. I think it's a leftover from when I last changed the Birmingham fasts (when the Wolverhampton terminating service merged with the Birmingham to Scotland one). Time for another savegame update. The most notable change this week is that we have our first non-passenger train! It's the route I mentioned last week from Eastleigh to Tonbridge with a convoy like this. Upon load you'll find it at Eastleigh. I've also added Dollands Moor sidings near Folkestone, which will serve as the base for some future freight. You can [https://www.dropbox.com/s/mjtv3breez5fmxu/UK-Feb17.rar?dl=0]download the savegame here[/url]. I think we are blockage-free at the moment. Let me know if you find anything wrong. - Railhead treatment train from Eastleigh to Tonbridge added. Runs once per 'month' (12 hours) via Redhill & Guildford. 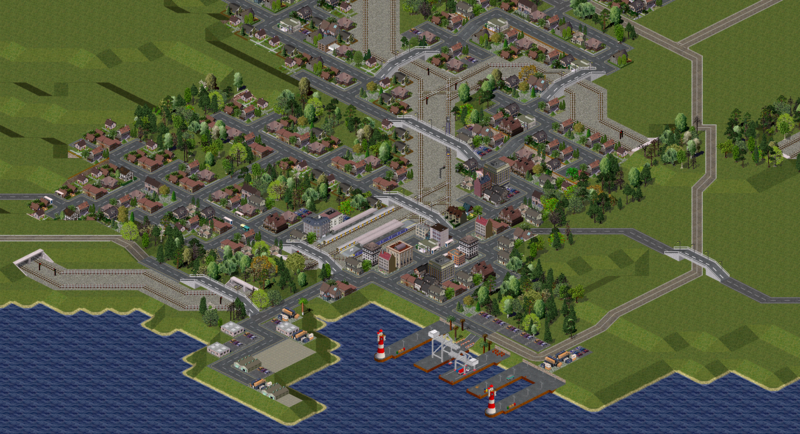 Here's a screenshot of Dover, which was revamped this week. It shows the busiest point in the hour. Two terminating services from Victoria and Charing Cross wait as the High-Speed East Kent circular service calls at Dover Priory in both directions in turn. The Eastern Docks could probably still stand to be improved. 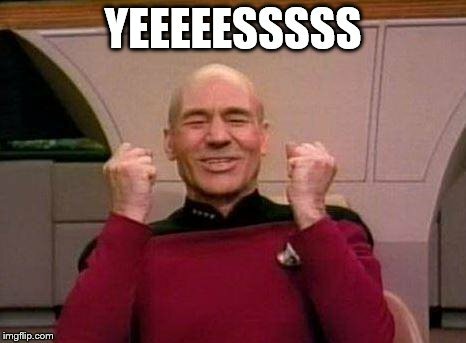 Nice updates, BUT! There are blockages which are not solved, the common blockages are at Edinburgh, Cardiff, Doncaster, Leeds, Sheffield, Manchester, Preston and Chester. I can not think of anymore ATM. I will notify you when there are blockages. It's all in one image but you'll be able to extract what you want easily enough. fam621, I think most of those are old problems that are now solved. I ran the map for a good long time when setting up the RHTT train and didn't find any issues Let me know if you find any, though! Lewis, can you also compile the RHTT for pak128-Britain please? I'd be ever so grateful. Its for my Fictional UK Map. Go ahead - feel free to use those graphics as you wish. Reinstalling a fresh version of the pak did solve the "train too long" message popping up. The train is still one coach too long, not sure if this is intentional or not. I got another "train too long" error for convoys 2344 and 2346 on the Manchester Pic - Bournemouth/Bristol line, and they are overhanging the platform at Manchester Pic. It looks like 8 car Voyagers were used for those two instead of the 5 car Voyagers. Looking at the RHTT, it makes several strange 90 degree turns entering and exiting Redhill, probably because the track layout doesn't have a straight route between the platform and the lines that it enters and exits from. Thanks Kage. I'll sort those in due course. Redhill is tricky - it's a very sharp turn into the Reigate line, and very hard to arrange the tracks so that there isn't a 90 degree for some routes. I'll take another look at it. I would like a RHTT for my fictional UK map for pak128.britain-Ex-0.9.2 please Carl. I only really deal with pak64 size graphics but you're welcome to adapt the files above as you like. Quite a lot to share this week. Here's an [https://www.dropbox.com/s/mjtv3breez5fmxu/UK-Feb17.rar?dl=0]updated savegame and pak folder[/url]. Here are a few things that have been added to the map, including one that was a bit of a spotaneous creation. - Eurostar services added: two lines, Paris and Brussels, both of which operate two-hourly. They go through part of the Channel Tunnel and then stop at the edge of the map. Class 374 (e320) has been added to support this. 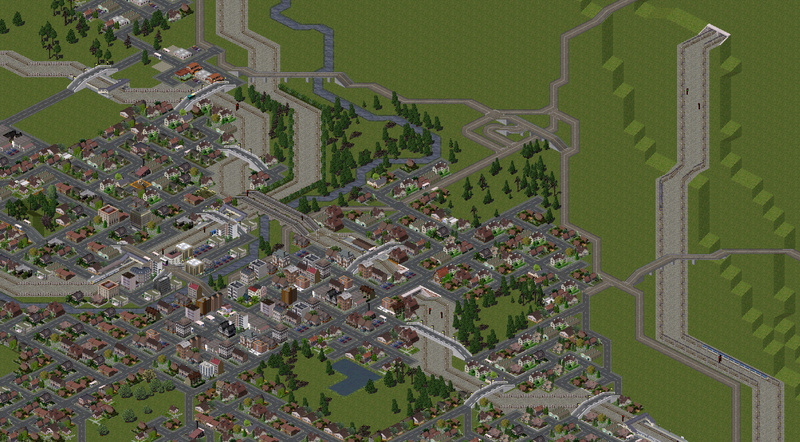 It's altered a bit to fit the constraints of the map: only 12 coaches/6 tiles. 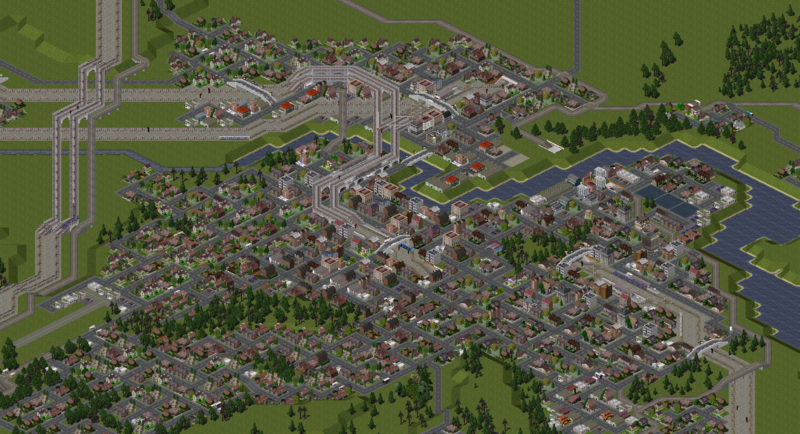 - Added new city buildings and updated old ones (see above). They are all adapted from existing graphics - some pak.128, some elsewhere and are designed to blend in with the existing style. - Added three new IND ground squares to use for building farms. Two of these are above. 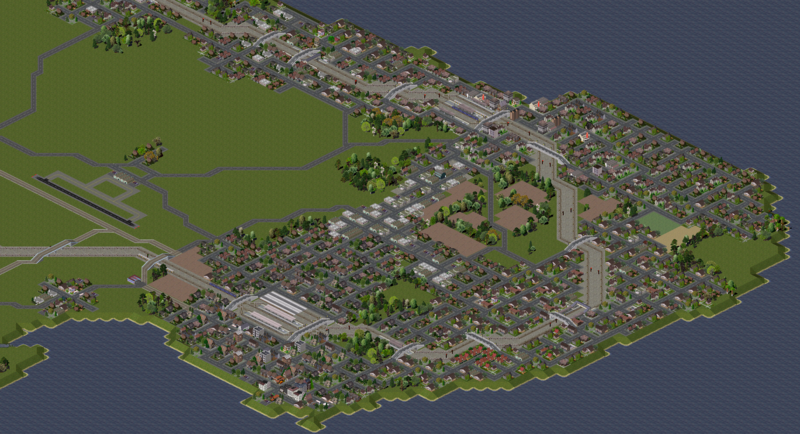 Above is a screenshot of Thanet, showing Margate, Broadstairs and Ramsgate (full size). This is the easternmost part of Kent. three highspeed services to London St Pancras operate each hour - one from Margate via Canterbury, and two 'circular' services - one which goes London - Medway - Thanet - Dover - Ashford - London, and one going the other direction. You can also see the closed Manston airport. I'm trying to gradually update the map's graphics as I go along. Here's a vague to do list of what I want to change. This is long-term - don't expect all this in the next week or month! - Golf course?! There are an awful lot of these in GB. Would be good to have some graphics. Well i am working on the class 360! not as big as the new game save though. Some progress on graphics this weekend. Tree linings for rail tracks and sprucing up the roads that I'm using as motorways/dual carriageways. Both are shown below. Will upload some pngs they're a bit more complete. Something you need to know Carl, press i on your keyboard on the save, then click on signals on left then watch over time how signals go onto the right side of the track. That's not a bad idea, thanks. I didn't realise that was an option. Nice! Stagecoach is the big gap in the current offering. I think the next step for those (and the other graphics above) would be to vary the colour tones slightly on different areas of the vehicle, which helps to give them a smoother appearance. Generally the roof colour wants to be different to the sides. Also some slight change in tone at the top and bottom of the sides makes a big difference. Take a look at some of the more recent pngs that I posted yesterday to get an idea of what I mean. Quite a bunch of additions this week, including Medway & Maidstone, updated train graphics, new tree lining and lake graphics, and another non-passenger service added. [https://www.dropbox.com/s/mjtv3breez5fmxu/UK-Feb17.rar?dl=0]Here's the savegame and pak folder[/url]. Note that these use the legacy Simutrans Experimental and haven't yet been tested with the new Simutrans Extended. Tonbridge, with the line branching off south to Tunbridge Wells. You can see the new blue Class 375 and the rail tree linings, both of which were added this week. Maidstone. High Speed 1 is on the right of the shot, and a Eurostar train passes. The new lake graphics are used here in Mote Park. The east-west line here runs from Ashford to London, and the north-south line runs from Strood (for connections to highspeed services) and Paddock Wood. Medway Towns, including Rochester, Chatham and Gillingham. Again, High Speed 1 passes to the left of the shot, alongside the M2 motorway. Highspeed trains run on conventional lines through Medway before joining HS1 after Gravesend. You can see one at Gillingham, on the right of the shot. The city versions of the new lakes are used for the docks in Gillingham. - Surface lakes added as IND tiles. Saves having to lower ground everytime for surface water (which tends not to look very good). 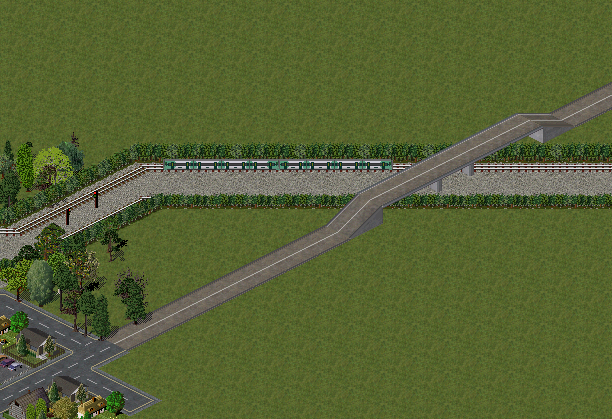 - Tree linings for railtracks added as wayobj. There's one version with catenary and one without. - Added a circular railhead treatment train from Tonbridge West Yard, via Ashford, Ramsgate and Sheerness (schedule here). This one is limited to 50mph because that seemed to best fit the timetable. Lewis: Good stuff, an MPV would be a nice addition! Any idea what kinds of routes they typically run? no idea what routes they run, from pictures it looks like RHTTs in the south west and diffrent engineering trains. I really like the hedges along the track. What addon is that? I downloaded the pak and savegame, and it appears to load fine in the new Simutrans-Extended! First time I look at it in game, it is really very much impressive! b - trains starting from platform will go in drive by sight mode, driving way to slow also risking deadlocks with other trains. Trains with a clearance from a signal appears to go in track circuit block mode. So, from the initial point of view, to futureproof the save, all you would need to do is put signals on the platformends and an immense number of one way signs! Great, thanks for checking it out in Extended! I'm a bit worried about some aspects of the new signalling system, but I'll take questions on that to the main board. Did the 'wait for 400% load' timetabling features function right, or will that all have to be changed too? The trains appeared to wait for 400% and leave when their time was up, so that didn't seem to be an issue! Also, the two block signals and long block signals need to be altered or checked, since the two block signal has become a proper distant signal, and the long block signal is just a normal signal but also creating directional reservations. But you might consider wait a bit changing over anyway, since the save game might become corrupt with the nightly builds and that would really be a shame! Thanks. Yes, I plan to wait for a while - not least because the task of making the required changes is daunting. Also 11.34/35 are more sufficient for my purposes so there isn't huge pressure to switch over until the new build looks suitably stable. I think this was covered here; but the technique is to build a tunnel entrance (ctrl+click), then use the 'lower land' tool to take it low enough to go below the ocean; then drag the tunnel until it connects with the other end. We should keep discussion of that to the other topic to avoid getting off track.